In The Longest Conflict: Australia’s Climate Security Challenge , I argued Australia’s ‘longest conflict’ this century would be the struggle to address our climate vulnerabilities at home and abroad. Our national security approach to a changing climate remains significantly underdeveloped and under-appreciated by our political leaders. When retired UK Rear Admiral Neil Morisetti launched the Centre for Policy Development’s report in June this year, he declared any national security strategy failing to deal with a changing climate was a flawed strategy. Prime Minister Turnbull, Defence Minister Payne and the National Security Committee must heed this warning in revising the Defence White Paper. The Federal Government has the chance to address climate security far more seriously and in doing so develop a credible and shrewd long-term strategy. This strategy should identify not just climatic threats but also opportunities for Australia to strengthen and deepen its ties within the Indo–Pacific through action on climate security. Climate change undermines regional human security, with inaction breeding greater insecurity. Conventional wisdom about Australia’s geography is that we are uniquely located to capitalise on the unfolding economic expansion in East Asia. However, missing from this assessment is an understanding of the climate security challenges confronting our region—which is the most vulnerable in the world to a changing climate. We are situated at the frontline of emerging climate crises that threaten long-term destabilisation in the Indo–Pacific. Asia is a precarious mix of dense urbanisation, low-lying coastal areas, rapacious resource demand and catastrophic natural disasters. 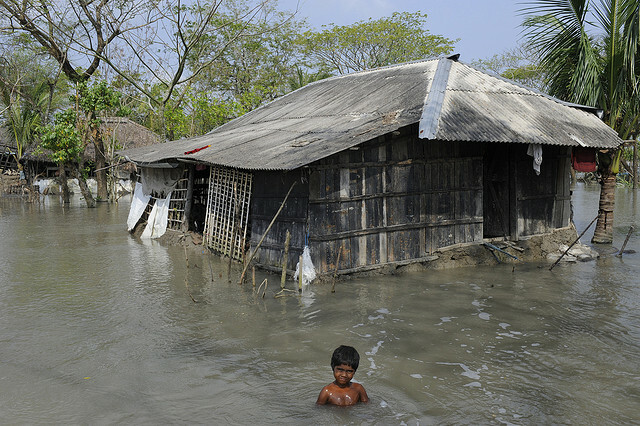 Seven out of ten of the world’s most vulnerable countries to climate change are in the Asia–Pacific. Asia has approximately 90% of the world’s risk of tropical cyclones. On a conservative estimate, by 2030 about 880 million people will live in low coastal zones vulnerable to storm surges and sea-level rises, with 70% of these living in Asia. Tensions caused by increasingly scarce food, energy and water will be exacerbated by climate change in a region already adjusting to a more fluid and contested geopolitical order. Emerging superpowers will be jostling for security alongside developing nations with fragile economies and equally fragile governments. The Middle East is a perfect example of how climate change can act as a threat multiplier in fostering political instability. Australia has a constructive and positive role to play in collaborating with our partners and neighbours in building climate resilience and improving regional human security. We can strengthen both our hard and soft power with the right approach. The US and UK are the prime examples of major powers actively addressing climate security at the strategic and operational level. The UK’s latest National Security Strategy and Strategic Defence and Security Review released in November explicitly outlines how it could use climate change constructively to extend its global influence, including how it can build resilience in particularly vulnerable states. For instance the UK will strengthen its cooperation with ASEAN states particularly regarding humanitarian aid and disaster relief, as well as prioritise climate change in its bilateral relationships with South Korea, India and China. We should follow suit considering how pivotal these countries are to our immediate security interests. Utilising our meritorious ADF, Australian should offer leadership that encourages regional cooperation on defence preparedness for climate crises. Australia should undertake climatic risk assessments with allies like Japan and the US, and strategic partners like Indonesia to identify critical regional vulnerabilities and to then develop joint responses. This includes likely humanitarian flashpoints in the region (such as population displacement in Bangladesh or extreme heat fatalities and power outages in India and Pakistan) exacerbated by climate change as well as mapping present and future resource insecurities. Equally important is improving cooperation with regional neighbours, especially ASEAN members, to ensure effective responses at times of crises. Executing effective joint-responses to humanitarian and natural disasters will be pivotal in coming years. Similarly, war-gaming scenarios should be undertaken that plan for climate security challenges such as energy shortages, natural disasters or climate-induced population displacement. Rim of the Pacific Exercises (RIMPAC) for instance offer a valuable array of partners with which to undertake such activity. In discussions with CPD throughout 2015, senior ADF officials demonstrated a willingness to tackle the big climate security challenges proactively. This requires concerted political leadership from the Government. Further, Australia should work with neighbouring countries to invest in and improve their climate adaptation capacity, in particular the resilience of vulnerable communities. Prime Minister Turnbull flagged this at COP21, but much more can be done. A recent global study by Portland Communications ranked Australia 6th in the world on soft power. We could better utilise our soft power reserves in order to address climate change more aggressively. A strong and well-financed aid and development program that invests in local climate adaptation and mitigation programs in the region will improve the capability of our neighbours to prepare for the future and enhance human security in a changing climate. Additionally Australia should look to boost regional climate literacy and adaptation expertise by harnessing our other soft power assets like commercial expertise in primary resource management, urban design, early technology adoption and innovation, or our world class international education services and exchange programs. Such international contributions will strongly signal our commitment to a peaceful, orderly and prosperous Indo–Pacific. The latest indications from the IPCC are that climatic impacts are actually accelerating beyond current estimates. By Christmas, the world passes the 1 degree Celsius temperature increase, half way towards the scientifically accepted threshold of 2 degrees Celsius by end of the century. The UN confirmed in November that 2015 has been the hottest year on record, with 2011–15 the hottest five-year period. Accelerated temperature shifts only increase the human security impacts felt by our neighbours and partners. It would be short-sighted not to infuse our foreign and security policies with a long-term strategy for tackling this profound security issue and would represent another lost opportunity to deepen and broaden our regional relationships in the Asian Century. Rob Sturrock is policy analyst at the Centre for Policy Development, and lead author of the 2015 report The Longest Conflict: Australia’s Climate Security Challenge. Image courtesy of Flickr user DFID.